Register below to schedule your visitation today. New Generation Accredited Private School for Grades 5-12! Take advantage of this unique opportunity to discuss the exciting future of Gentry Academy! Gentry Academy is a private school with a traditional classroom setting, ensuring a low student to teacher ratio that never exceeds 20:1. Gentry Academy was founded on the belief of providing excellence in academics, leadership and physical education. 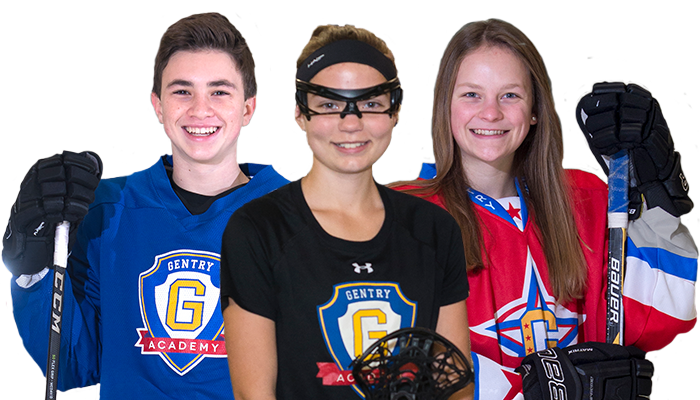 Please join us at Gentry Academy in Vadnais Heights, MN to preview the Gentry Academy culture, tour our brand new, state-of-the-art facility and meet our world-class team of teachers, instructors and coaches. We will give a short presentation outlining the vision and future of our academy, and illustrate the opportunities our culture provides that do not exist in any other private or public school setting. Our teachers will review our academic curriculum, college prep and entrance tests as well as our exclusive Pathfinder Program that provides internships for our high school students. Our leadership curriculum will also be featured, illustrating how our students are taking ownership of their academics and physical education as well as their everyday life and how they are learning to give back to the community. Our talented instructors will showcase our new athletic programs as we are now offering hockey, golf, lacrosse, cycling, baseball, dance and gymnastics for our students. We will review the development model based on birth year, where every member of the team is valued and contributes. We will also review our schedule and cost for the calendar school year. Additionally, we will provide time for a Q&A session and offer a one-on-one opportunity to ask our Gentry Academy teachers, instructors and coaches questions. There were errors during processing. Please review the required fields and try again. Thank you for registering. We look forward to seeing you! Our staff will reach out to you in a timely manner. Gentry Academy understands that leaders are not cut from a mold, or created from a one-size-fits-all system, which is why we have developed a curriculum that allows students flexibility to tailor their educational path to fulfill their aspirations, with heavy emphasis on leadership and investigative thinking. Parents and students are invited to join us for an interactive open house at Gentry Academy, located on the Vadnais Sports Center campus in Vadnais Heights, Minnesota. Preview the Gentry Academy culture and gain an understanding of how we are different than other schools. Tour our new state-of-the-art facility and meet our world-class team of teachers, instructors and coaches. Plus, receive information about our dynamic learning environment that integrates the core academic curriculum and required electives with our flexible W.I.N. (What I Need) time schedule and hallmark leadership and life skills program. Student-athletes participating in the Minnesota state high school league for an elected sport are restricted from development with their coach in that elected sport during the off-season.